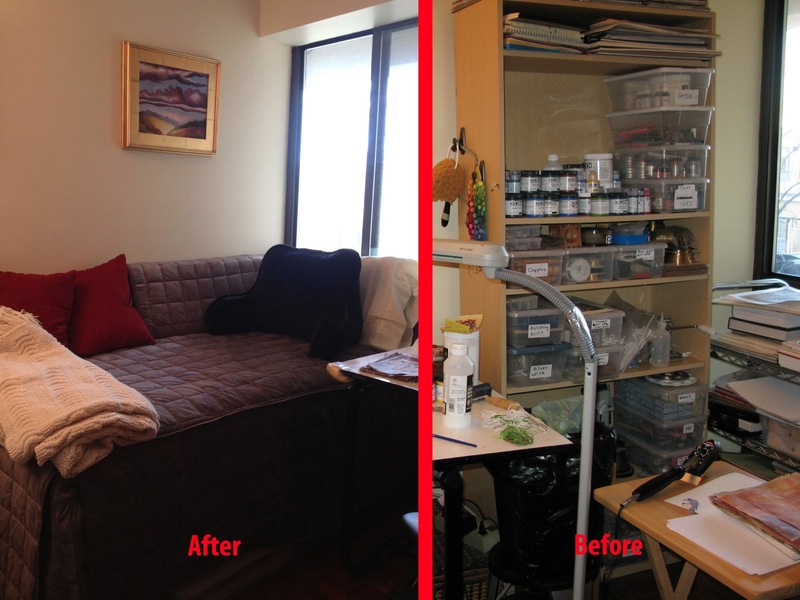 I thought I would share with you what my studio looks like now with the bed installed. The only piece of furniture I had to get rid of was that tall shelf you see in the photo. There are some shelves on the opposite wall that you can't see in this photo where I was able to put all my paints. The rest of the old jewelry supplies are in the closet in plastic bins. It is kind of weird that it was only a few months ago that I decided not to make jewelry anymore. It turns out to be a good thing because I really couldn't make jewelry with a bed in the room. There is too much filth involved in jewelry making between sanding, drilling, filing etc. Painting and art making are much cleaner activities (some of you may disagree with me on that one) but relatively speaking it is cleaner. No dust masks needed with acrylics! Well, at least I mailed out my postcards today for the postcard swap. One of the people on my mailing list lives in the town where I was born, New Bedford, MA Imagine that! Small world! I hope to have some new art to show soon but for now I need to rest. Have a lovely weekend everyone and thank you all for all your kind words and comments on my blog. As always they are really appreciated. Roberta, it really looks great! It even looked great with the bookcases as a divider! Can't wait to see your process and end result. You are such an amazing artist. Hi Roberta, I like your studio. It reminds me of mine, although mine may be smaller as there's no room for anything as luxurious as your seating. I am happy, productive, and focused in my tiny space. Did you know that Jacob Lawrence worked at home? He had a small room at the top of his house in Seattle. 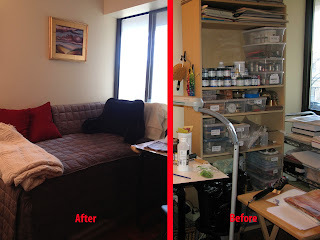 I hope you have many productive moments in your revamped space! I'm signing my full name as I need to post anonymously. Thanks Sarah! I did not know that about him although I seem to remember many of his paintings were of an attic space. That must have been his studio. It looks really good. Can I come over and take a nap while you work? LOL Sara. It is almost too comfy in here now. How am I supposed to get anything done? I'd like to lay there and read a book...on art, of course.